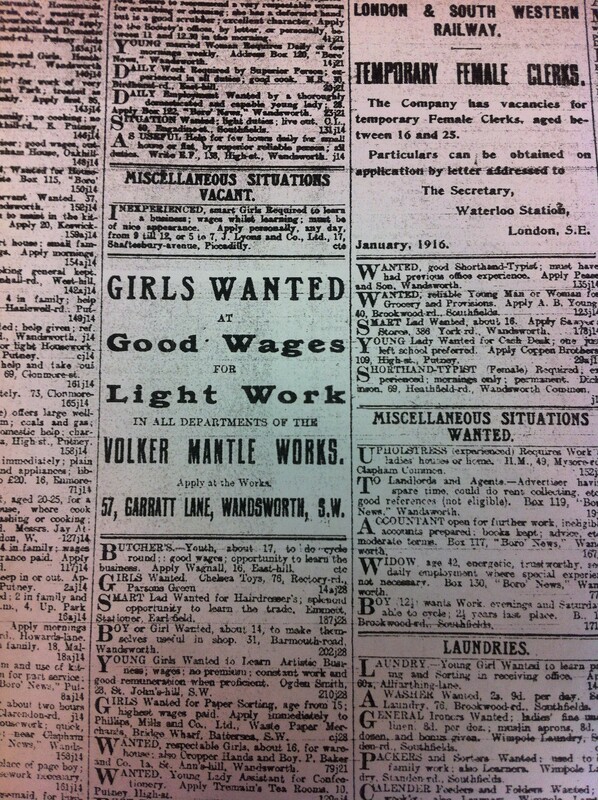 Home supplies were raised at the meeting of Wandsworth Borough Council on 24th May 1916. A letter from Lady Denman suggesting that restrictions on keeping chickens and other fowl should be lifted for the duration of the war to encourage people to keep their own was met with the response that no such restrictions currently existed, before the meeting moved on to the price of milk. That in the interest of Public Health and Child Welfare, this Council view with grave concern an increase in the price of milk, particularly at a time when Local Authorities are being urged by the Government to exercise every precaution in the care of infants, and respectfully urges the Government to take such steps as may be necessary to control the price of milk in the interests of the children of the nation. The Public Health Committee recommended that no action be taken, and the Council agreed with them – although Councillor Hurley did say he did not see why milk should be 6d a quart and that the Council ought to concur with the resolution. Ironically, several of the adverts on the page reporting the meeting in the Wandsworth Borough News were for local dairies, Morgan & Sons of East Hill and C H Cookson of Creswick Dairy Farm, Earlsfield Road among them. Cookson’s claimed to be the only dairy farm in Earlsfield where cows are kept on the premises. The Council also raised strong objections to the suggestion that Conscientious Objectors could work for them in posts vacated by men serving with the Armed Forces. The Committee on work of National Importance had suggested it as a possibility for Tribunals to determine what work COs could take, and had supplied a list of potential posts. They hoped that the Council would employ people who had gained exemption based on getting a job considered of national importance – a suggestion to which the Council “strongly protested”. George Archer-Shee (6 May 1895 – 31 October 1914) was a young Royal Navy cadet whose case of whether he stole a five shilling postal order ended up being decided in London’s High Court in 1910. The trial, which became a British cause célèbre, was the inspiration for the play The Winslow Boy by Terence Rattigan. Archer-Shee was successfully defended against the charges by the notable barrister, judge and politician from Ireland, Sir Edward Carson. 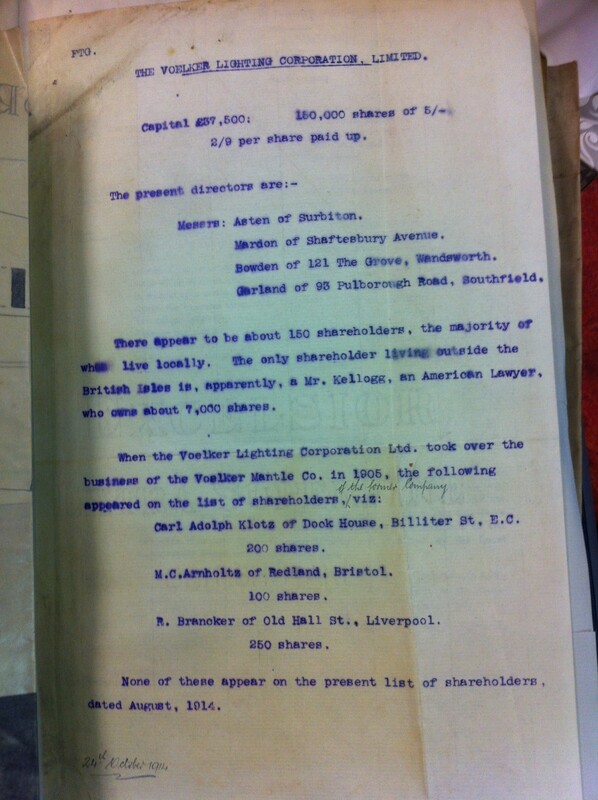 Following the acquittal, the boy’s family were paid compensation in July 1911. Archer-Shee was commissioned in the British Army in 1913, and killed aged 19, at the First Battle of Ypres in October 1914. The full story of George’s acquittal can be found here. But how did he come to be on the memorial, as he has no obvious connection to Roehampton? George is honoured on the Society of the sacred Heart War Memorial as his half-sister, Winifrede Archer-Shee was at school at Roehampton, becoming a novice in 1908 and ultimately Mother Superior at Roehampton. In her memoirs, held in the Society’s archives, she is quoted as saying “This place [Roehampton] has always meant more to me than any other place”. With thanks to Gilly King, University of Roehampton, who provided the information and photographs in this post. Copies of The Winslow Boy play text and on CD are available through Wandsworth Libraries. 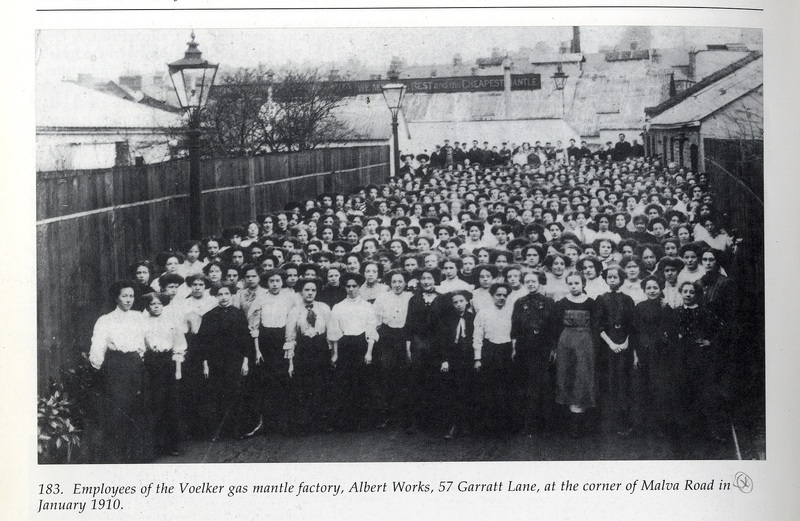 Wandsworth Gas Company, based by the river on what is now the site of the recycling centre, owned a coal ship named the Wandle, which was the centre of much celebration in Wandsworth this week in 1916. A few days earlier the ship had left Newcastle with a shipment of coal, heading for London, when she was fired upon by a submarine. The decision was made to return fire, and shots were exchanged for about half an hour before the submarine vanished. 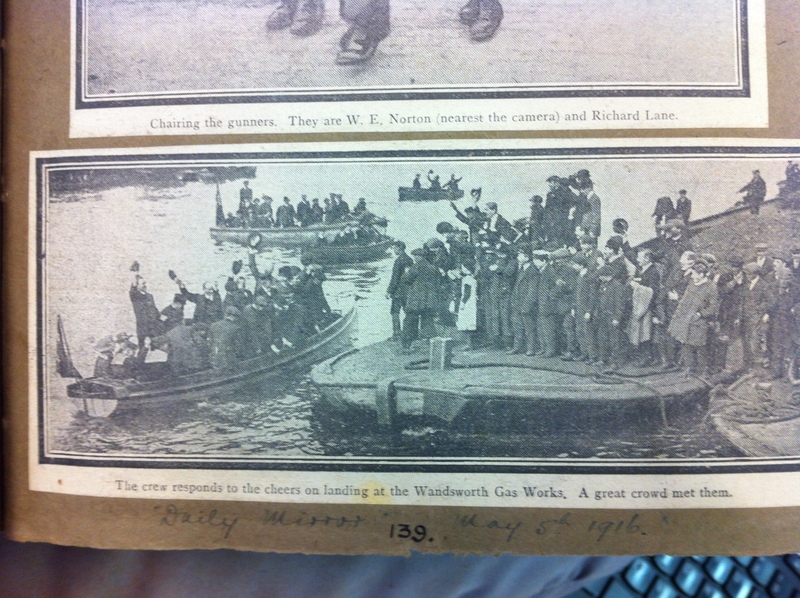 It was believed that the submarine was sunk by the Wandle, although this is difficult to prove (see here), and the arrival of the crew back in London was greeted with much celebration. We have a series of scrapbooks called “Wandsworth Notes”, which contain newspaper clippings, magazine articles and photographs about Wandsworth events and history, put together (we think) by one of the early borough librarians of Wandsworth Cecil T Davis. Davis certainly wrote a lot about Wandsworth history, so it seems reasonable to assume that Wandsworth Notes is his work. Seven pages are dedicated to the reception of the Wandle as she returned to Wandsworth, including pictures. As the Wandle came up the Thames, there were crowds on the riverbanks and bridges to cheer her – the captain was from Greenwich and according to the South Western Star “all Greenwich cheered as his ship as she passed”. The Daily Chronicle reported a huge cheer from Tower Bridge, and thousands of people at Blackfriars and all along Victoria and Albert Embankments. MPs paid their respects from the Westminster terraces, and nurses and patients at St Thomas’s Hospital waved little flags. 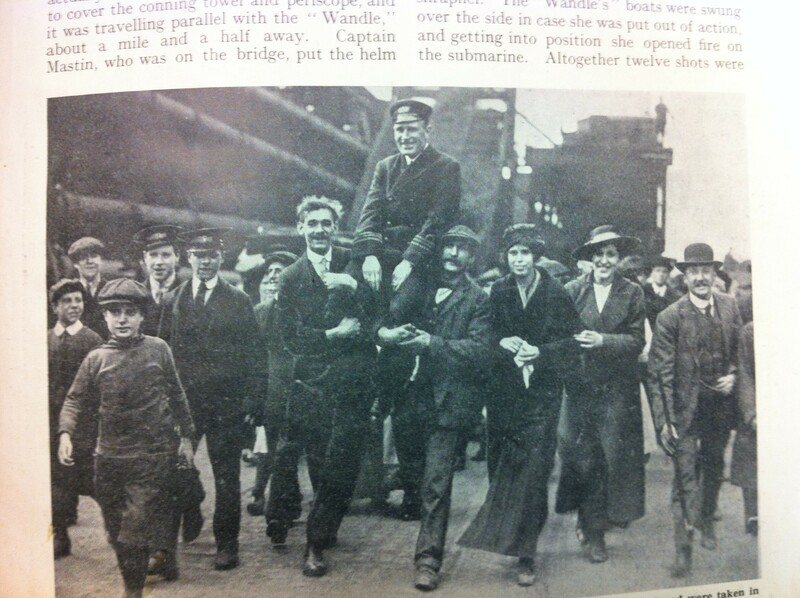 Wandsworth Bridge was “almost dangerously crowded” as the Wandle reached home territory, flags flew from the gasometers and the crowds were singing, when the Captain actually reached shore he was carried shoulder high by the crowds. 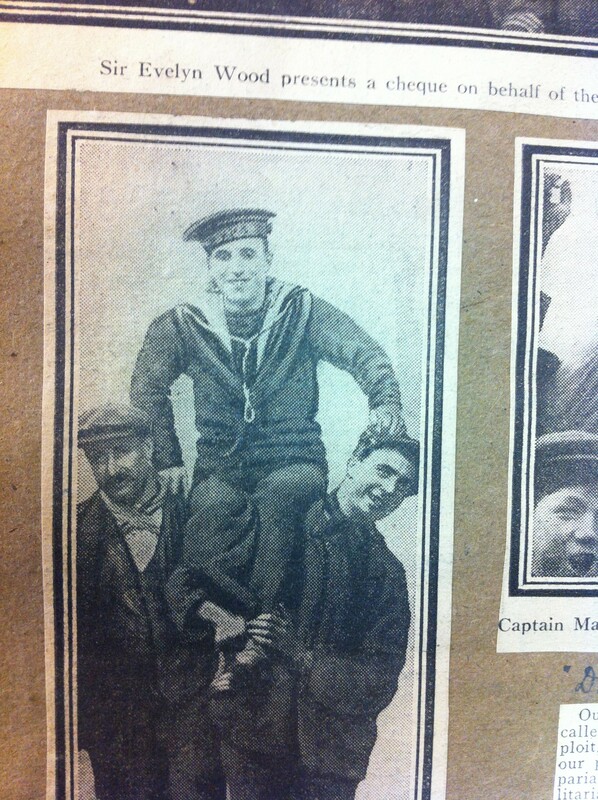 The photographs show the gunner being carried in as well, although the papers give more credit to the Captain, and the Mayor announced his intention to grant the Captain a silver medal on behalf of the borough. There is a photograph of the presentation of the medal in Wandsworth Notes – although it isn’t dated and the Council minutes for 1916 do not refer to it, so we can’t be sure when it was taken. 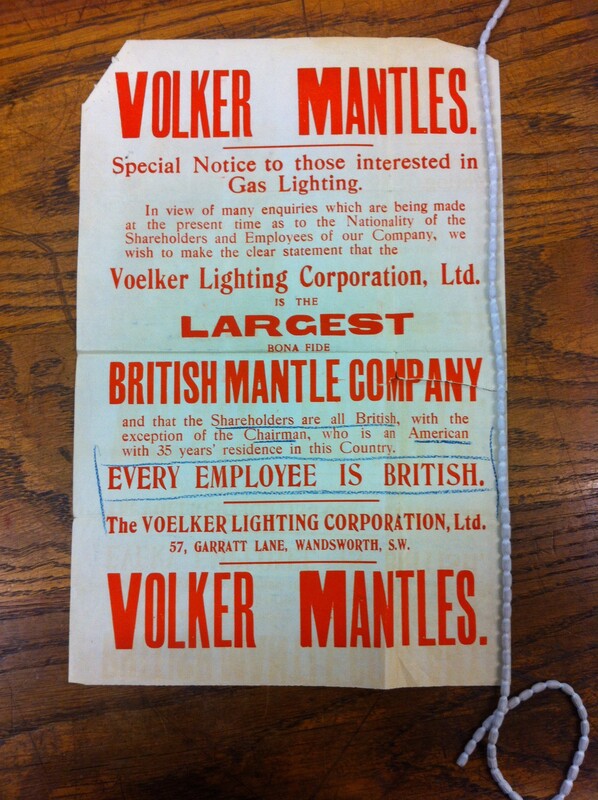 Zeppelin raids over Britain, although they had not yet touched Wandsworth, were having effects, with a large increase this week in reported prosecutions for having bright lighting. The last time a Zeppelin had successfully attacked London was October 1915, but in March and April there had been several unsuccessful attacks – unable to reach London, Zeppelins had bombed other parts of the country instead. The Defence of the Realm Act 1916 had brought in powers to restrict lighting, amongst other things, and over the last few months the local councils had dealt with issues relating to the restrictions. This included considering whether or not kerbs should be whitened to make them easier to see (Wandsworth Council, April 1915), and carrying out works to comply with the new regulations (Battersea Council, October 1915). The local papers usually report one or two prosecutions, but the South Western Star of 28 April had almost half a page with details of them all. James Collins was prosecuted for failing to shade a light from his kitchen window in Sheepcote Lane. When spoken to, he said he “was just doing a bit of reading” – the window was at the back and perhaps, like Henrietta Swash of Haldon Road, he hadn’t realised he was meant to shade back lights. Both were fined 20 shillings. Several people blamed others for the light. William Hampton, of Railway Wharf, said that his clerk had forgotten to draw the blinds on the office window and a motor shed. Arthur Whitney of Bridge Wharf, Wellington Road, said that the office boy had forgotten to draw the blinds on his office. Whitney was fined 10s but Hampton was fined 40, presumably because more lights were visible in his case. 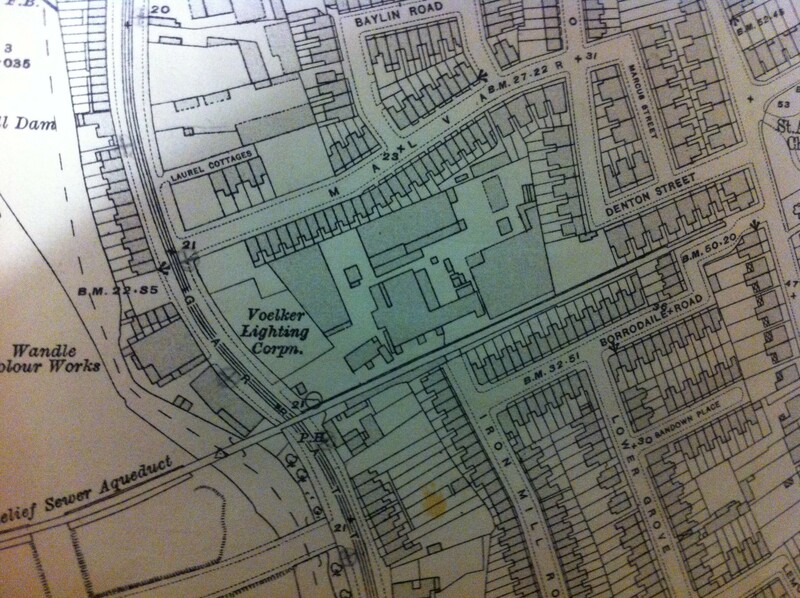 Fanny Self, who ran a boarding school on Nightingale Lane, was also fined 10s after the children had gone into a room and switched the lights on without drawing the blind. It seemed that many people blamed their servants for the lights showing, to the extent that magistrate Mr Garrett suggested that “In many cases I find the person really to blame is a servant. In these cases, I think the police should summon the person really responsible”. Despite that, Mr Gamble was fined 10s. Given that a maid’s wages (from the Situations Vacant column of the paper) were advertised as £18-20 a year, or sometimes 5s shillings a week, it was probably just as well for the maid that it was her employer who was fined.